Nothing signifies ‘play’ like this installation by Martin Creed. Photo by Nicolas Mirguet. What do maker spaces, bodily collisions with strangers, and sculptures made of Turkish delight have in common? They were all part of sessions at the recent 2014 National Art Education Association Convention in San Diego. To be more specific, they were all part of sessions that focused on a theme threading through the four days of sun and arts teaching: the spirit of play. That’s how I’m referring to it, at least. The same idea was talked about as “being OK with failure”, “going in without predetermined outcomes”, and “iterative approaches”, but it was all shades of the same thing, and it was popping up everywhere. (Side note: The importance of play in our work lives has been a topic beyond the museum sphere for a while. Here’s a nice, clear Psychology Today article from 2008 that talks about what play means for our brains.) People are interested in testing new ideas without knowing how they’ll end up, and I love it. Like my theme tracking after the last AAM Annual Meeting, I want to follow this one through the NAEA Convention, highlighting some (though by no means all) of the conversations, actions, and tweets that made it one of my top conference takeaways. Conference attendees were excited about this theme, too, and talked/tweeted about it throughout the day. Seema Rao of the Cleveland Museum of Art reminded us about taking chances. David Bowles from the Metropolitan Museum of Art talked about what motivated him to take part in the Noguchi Museum’s Teacher Think Tank (a program that started with the open-ended goal of getting museum educators and K-12 teachers together to think about museums and schools working together). On Saturday morning, a session called Museum Maker Spaces: Creating and Play for Adults (not to be confused with “adult play”) took up the playfulness banner. I’m sorry to have missed that session, but thanks to colleagues like Emily Holtrop (from the Cincinnati Art Museum) and Cate Bayles (from the John Michael Kohler Arts Center), I heard about some of its key themes on Twitter. No pressure for an end product? What do we get out of play? As the larger debate continues about how to make museums relevant, I’m glad these are some of the issues being posed. I’m a firm believer that the museum can be a space for more than an in-depth, object-centered experience. As a museum educator, yes, that’s at the heart of what I do in many ways, but is it the only thing I do? No. The only—or, dare I say best—thing visitors can experience when they come to a museum? Heck, no! Museums can be many things to many people. For those of us dedicated to making museums meaningful, setting up experiments and pushing the boundaries of what makes a “good museum visit” is a great way to find out what some of those many things might be. And for those who ventured into one or two or all of the Gallery Teaching Marathon sessions, risks and newness were there for them to find. Without speaking for my talented fellow educators who offered a wide range of experiences in the galleries that day, I will say the session I facilitated was exciting and invigorating to lead, and I hope fun to take part in. 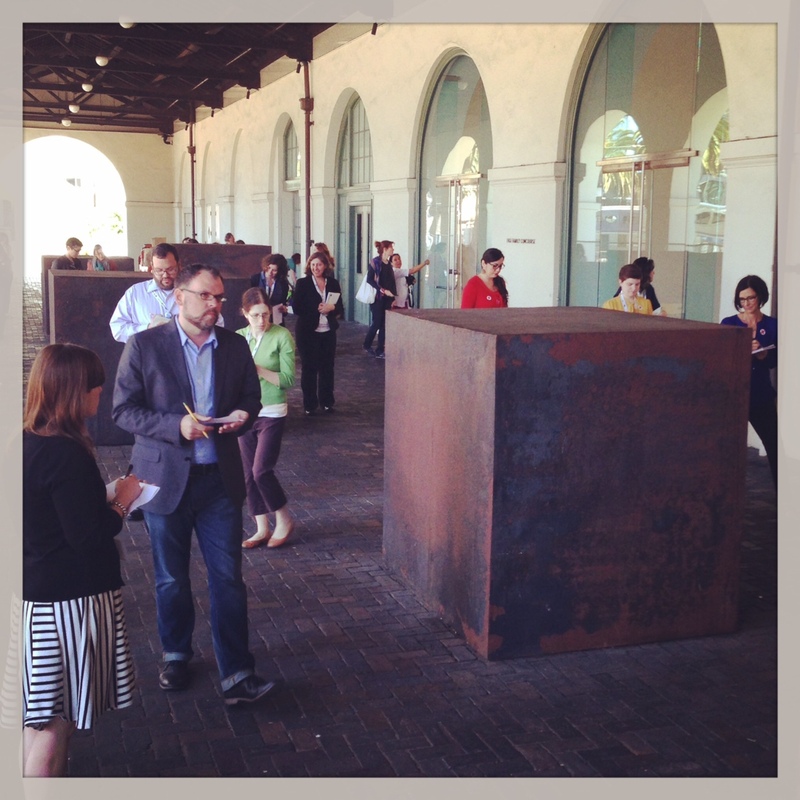 We used Richard Serra’s site-specific work, Santa Fe Depot to inspire us to write found poems, to focus on the environment around the work (up to and including the tourists dancing on top of Serra’s forged steel blocks, the commuter trains arriving and departing immediately next to us, and the pile of “organic sculpture” a dog had left behind next to the artwork), and finally, to create our own interpretive movements based on the words we’d generated. Throughout the day, the Marathon sessions were full of eager, interested attendees, gung-ho for all the weirdness that might come their way and then ready to reflect on it. For my part, I found it incredibly liberating to be trying something with no idea how it would go over. I liked explaining to the experimental adventurers at my session that I’d never done this before and talking about which elements of what we did made them uncomfortable and why. It felt like an exciting deviation from what I expect from my own teaching, which led directly to me thinking about how to make it less of a deviation. How can I take that spirit of fun, unexpected experiences in the museum and layer it into my job? How can I give the teachers I work with—especially now, when so many are stressed over standards and evaluation—the same kind of joyful, playful invigoration that I felt from all these NAEA sessions and colleagues? How can I spread my own belief that sometimes the most fun you can have in a museum comes from doing something within its walls that you would never have expected to do? That’s what I’ve come home thinking about, and I’d love to hear if this idea affected any of you, too. Any anecdotes to share about how the spirit of play has impacted your museum work? Any advice for spreading the enjoyably surprising? Any other NAEA sessions you attended that connected to this idea? Share your thoughts in the comments. If you want to read more about some of the things I’ve mentioned, check the Twitter hashtags #naea14, #naeamused14 (for museum-related content), and #galleryteachingmarathon. There’s also my complete Storify account of the Convention, which has plenty more tweeting about the spirit of play, and Olga Hubard’s recent reflection on the Gallery Teaching Marathon itself (touching upon some of these same ideas). Their website has good resources. Our next big challenge is extending the ethos of play-based learning to all ages, not just kids. Thanks for that great link, Emily. That’s one thing that was so invigorating to hear at NAEA: how many people are thinking about playfulness extending beyond kids. Rachel, thank you for this post! Since I wasn’t able to attend NAEA this year, I’ve been looking forward to seeing everyone’s reflections (despite my attempts to filter, following via social media far away was a bit too noisy, and I had to let go of my FoMO). I love how “failing often and fast” and “play” are becoming increasingly relevant notions for our field, but it’s not a new concept to our game design friends or ludologists (those who study games and play). But, it’s interesting to think about how we can create these kinds of experiences for ourselves in our work environment in addition to creating these experiences for visitors engaging with our museums’ collections. Perhaps we should start a gamified project for our fellow museum educators, and award them with badges for completing/participating in certain experimental initiatives? We could use Credly. Actually, this might be a really freaking good idea. Rachel, Mike, contact me? It’d be fun. I’d be happy to help. Argh, the automatic embed for the video removed the time stamp – the portion with the quote I’m referring to starts at 4:02. Sorry, all! Thanks for the game links, Rebecca! I took part in the Center for the Future of Museums’ recent foray into badging for the museum community, and continue to have mixed thoughts on badging as a general concept (happy to talk more about those thoughts with you any time), but I think one place digital badges might be applied really well is in a game-like way, as you suggest. Especially as a way to motivate museum workers to stretch beyond their comfort zones. Rachel, I have reservations about gamification in general, and badges as well. But they are a growing trend and I do think they could be fun in an internal professional development sense. A good way to learn and experiment. Would love to hear more about your experience with the Center for the Future of Museums. We’ll find a time and way to chat, I’m sure!